Miller Performance is proud to offer one of the best options for tuning your M20 turbo project! Unlike other tuning packages, our system is designed to give YOU the control you desire over our engine and its tune. The W.A.R. Chip allows you to have the final say in your tune and allows you to modify your tune as your car and power evolves! Retaining the stock ECU offers so many advantages! Some of these advantages include retention of the stock diagnostic system, stock like driveability, stock like reliability and reduced stress and installation time. Many consider us the grandfather of mass air flow conversion technology for the older BMW's. Our experience with MAF construction, calibration and execution is now available for your M20 Turbo engine! Just like our other MAF sensors, our M20 Turbo MAF is assembled and calibrated in house to ensure perfect and consistent accuracy. All our MAF sensor are subject to strict quality control before the ever leave our facility. Because we have total control of our sensors, we can calibrate them for N/A use,or Forced induction use. Our sensors are ready for 400+ wheel HP and can be calibrated to read higher if necessary! Also included with our tuning package are six genuine, reliable BOSCH Injectors. They offer a multi-pintle design to provide an optimal spray pattern for improved performance and efficiency. They are a direct fit and require no modification of your existing fuel system. These flow matched injectors also offer excellent response characteristics to provide smooth and reliable performance and power. This piece of equipment really makes our tuning package stand out! 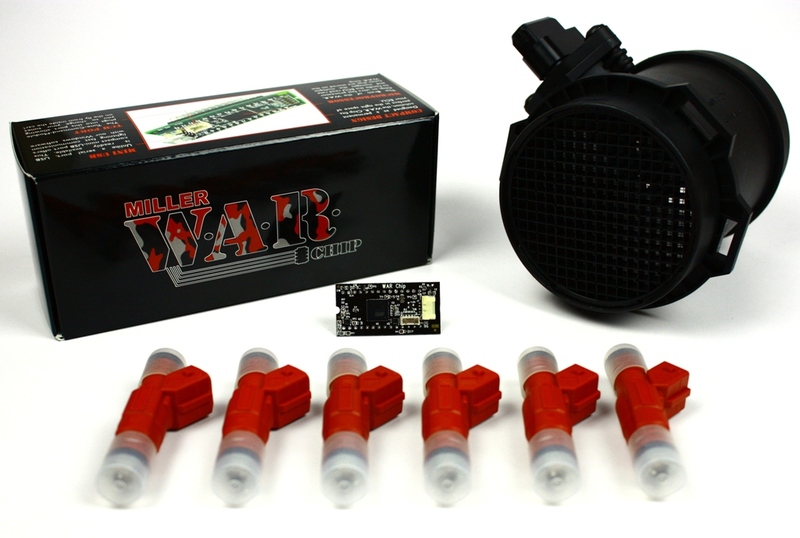 The WAR Chip is our end user adjustable performance chip! This gives you the final say in your tune and allows you to run it just the way you want! The W.A.R. Chip comes with our windows editing software which allows you to take our base tune(s) and modify them to suit you specific needs. The WAR Chip will allow your tune to evolve right along with your hardware. The W.A.R. Chip also allows you to store 4 tunes on one chip! This is great news for those who have multiple fuel types to choose from. One the fly, you can switch between the four tunes for the ultimate flexibility. You can switch between tunes for specific fuel types, meth modes, valet modes or whatever you can come up with! The choice is finally yours! Miller Performance always supplies you with a proper base tune for your application. Our base tunes have all been developed on our Mustang Chassis dyno with industry leading development equipment. With this base tune you will experience safe and reliable power. The base tune is safe for 5 - 20 PSI right out of the box! Our base tunes have hundreds of hours behind them and when you first fire up your newly boosted car, you will see our efforts speaks for itself. With stock-like flawless driveability and start ups, sticking with the stock ECU has never been a better choice! After you get set up and verify everything is working correctly, we can help you massage your base tune to specifically suit your car. If you just need us to explain how the software works, or you want us to do the remote tuning, the W.A.R. Chip makes this process leaps and bounds better than the competition. Because we can email you updated tunes, you don't have to wait for a new tune to show up in the mail! You can schedule a dyno appointment and give us the heads up and we can have you fine tuned and out enjoying your car in as little as one session!! !